Clients can order with us customised Hand Embroidered Fabric that is designed to perfection by our expert team of creative spurs. These embroidery find wide application in the manufacturing of garments, curtains, sofa covers, table runners and other home furnishing items. 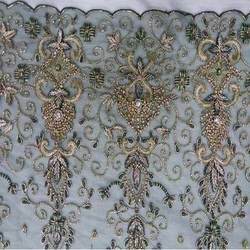 Our fabrics are also available in both options of hand embroidery and machine embroidery. We offer our extensive range of superior quality Fabric Hand Embroidery Services that is available in attractive and stylish designs, colors and fabrics. These designer lehenga cholis are eye catching and intended to suit special occasions of our esteemed clients. Furthermore, our range is available in economical rates to suit the clients’ requirements. We are amongst the highly reliable and trusted organization which provides excellent service for Heavy Embroidery Work. We offer very beautiful and elegant looking thread embroidery services perfect for decorating different type of fabric materials.